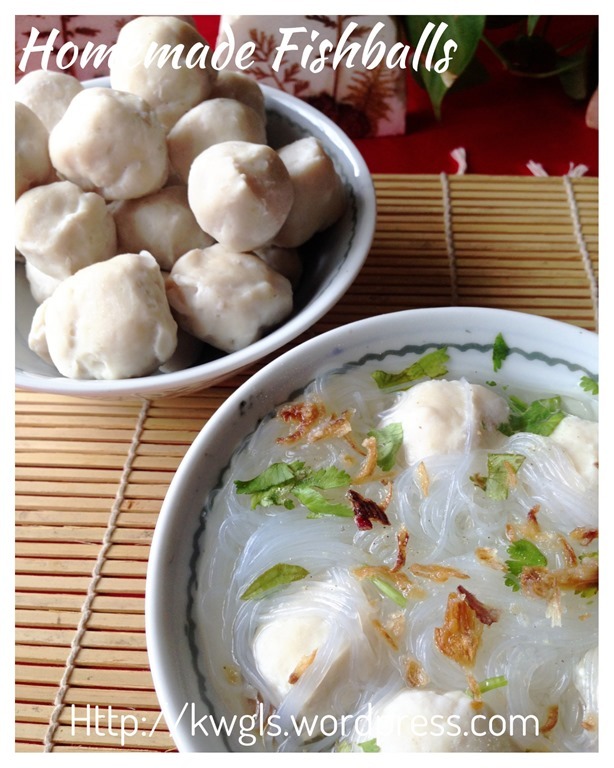 When I was young, it is not common to have fish balls sold in the counter.. 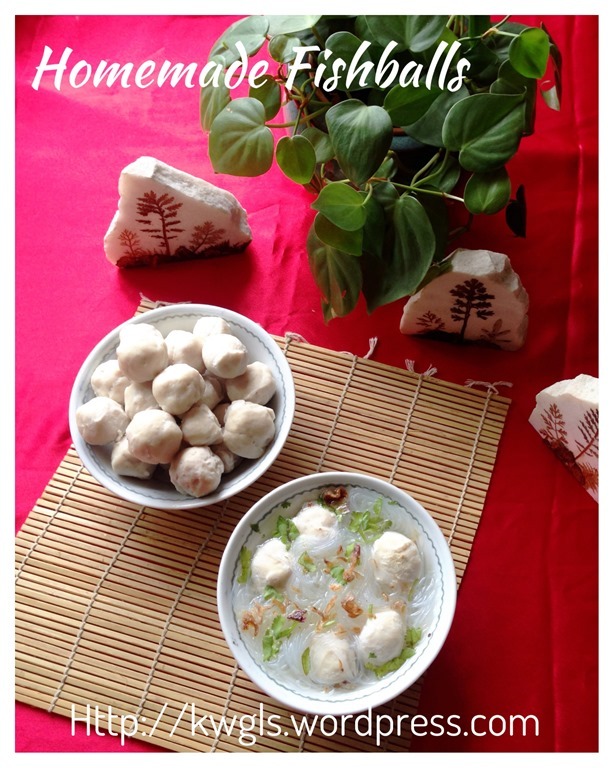 If you want to eat fish balls, families will have to prepare their own fish balls. Well, then recipe is very simple, just debone to get the meat, chop, slam and shape.. 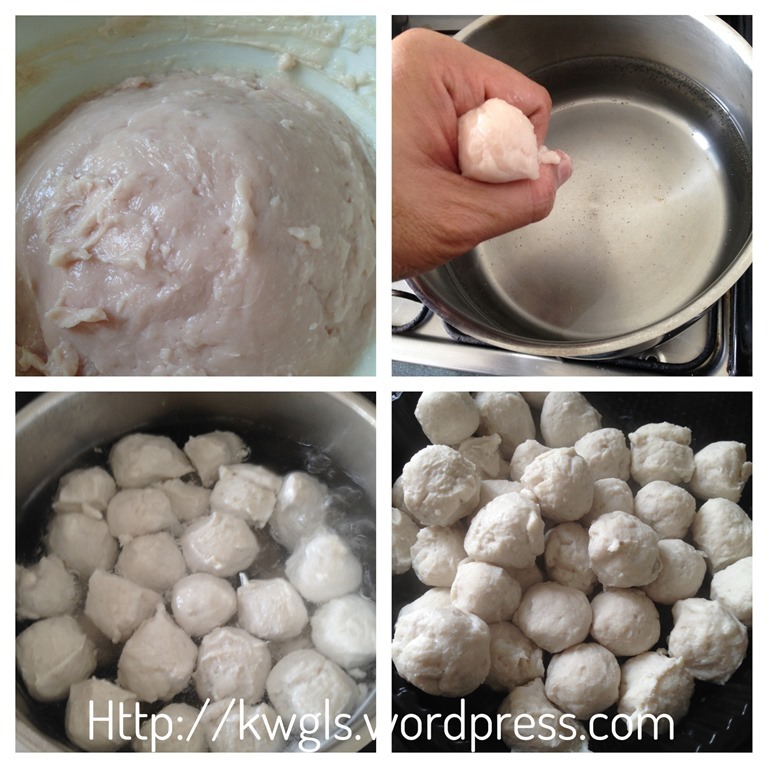 Nothing to shout about and most families will know how to make such fish balls. As time went by, stores started to sell fish balls. For those wet market version that sells fresh fish balls, they are preparing it on the spot by dropping the fish paste into a pot of hot water manually and it is consider as done when the fish balls floated up. The texture is not much different from the one prepared at home. But supermarket sold another type of fish balls that are very bouncy and springy and I am prejudiced to term it as “ping pong fish balls” .. I have never liked these supermarket fish balls since it was introduced to the market .. It is overly springy, some are rather fishy and some are very salty.. 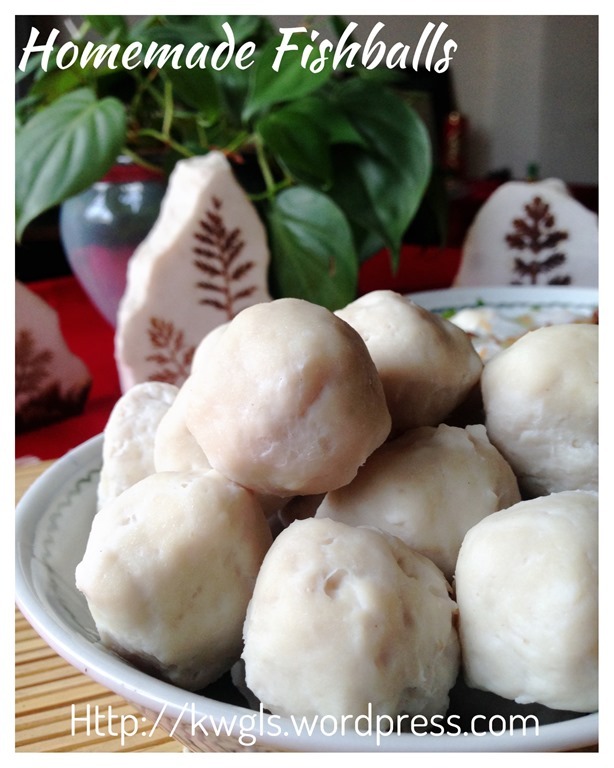 However, I do miss the homemade fish balls that are slightly firmer, not as springy as the “ping pong” fish balls. If you can’t imagine the texture, it resembles sotong balls or prawn balls or even meat balls commonly sold in the supermarket.. 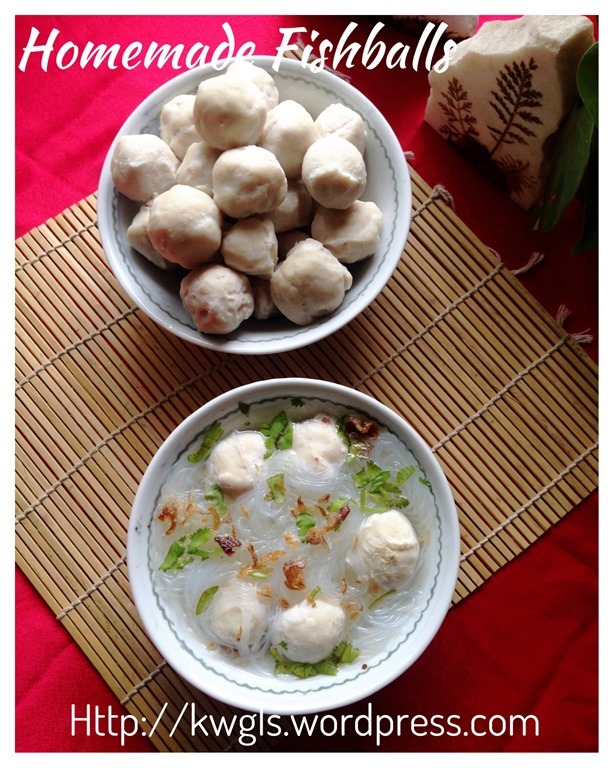 If one can accept squid or prawn balls, I am sure he or she can accept the texture of these homemade fish balls.. 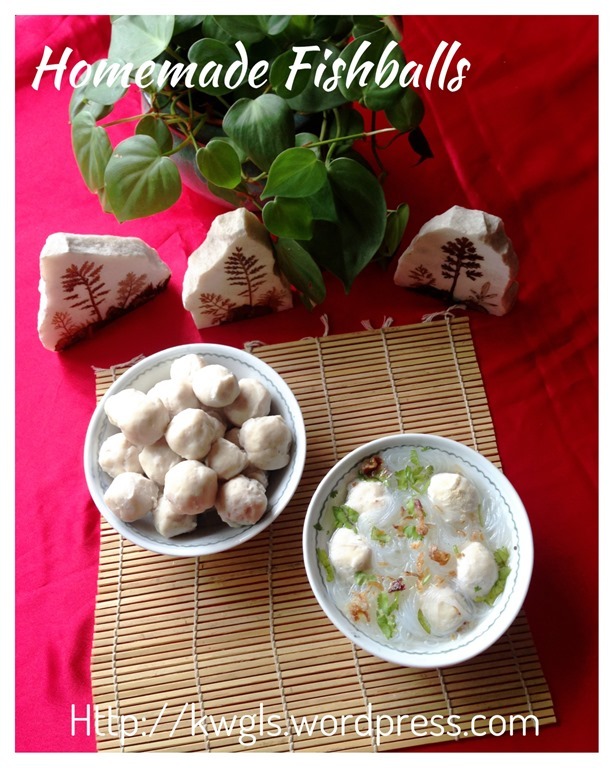 Fish balls recipes are very simple but one of the challenges of making the fish balls is to make a bouncy fish ball. 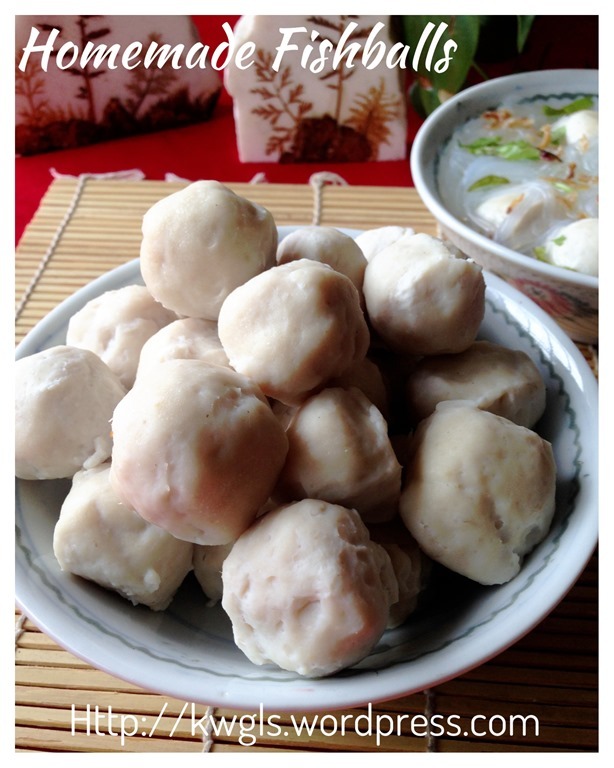 Some said to slam the fish balls for a long time, some said adding baking soda, lye water (alkaline water) while others have resorted the use of tapioca starch or sweet potatoes starch; some frozen the fish meat while some uses egg white to smoothen the fish balls. Whatever method used, what I can assure is that homemade fish balls will never have the same texture as the factory produce fish balls. 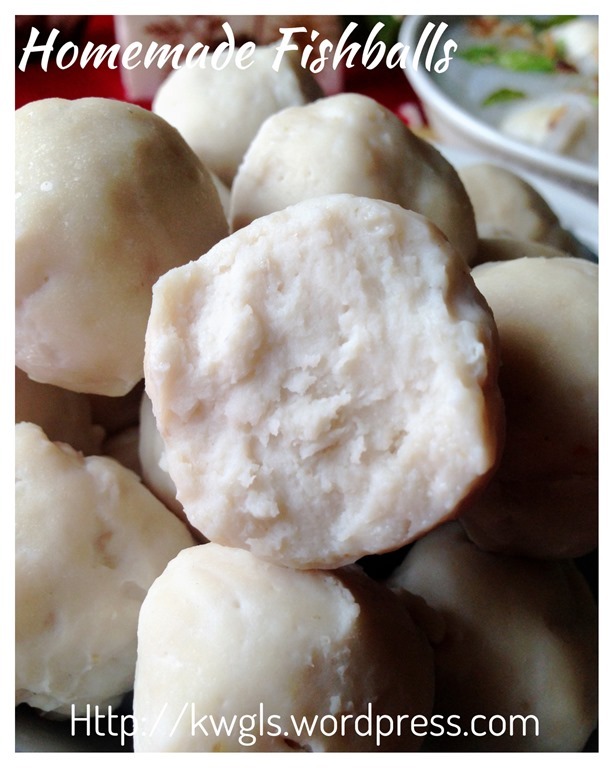 If readers are looking for the texture of commercial sold fish balls, this recipe may not be suitable for you. I am pleased with this batch of fish balls. It is firm and springy. It;s sweetness is derived purely from the fish itself. Not much starches were added and hence a fish ball is equivalent to a mouthful of fish meat..As for the shaping, my hand is no machine and hence size is not regular and shape is not actually round. I am sure readers will know what I mean after trying out the recipe as we are dealing with some sticky paste of fish meat. 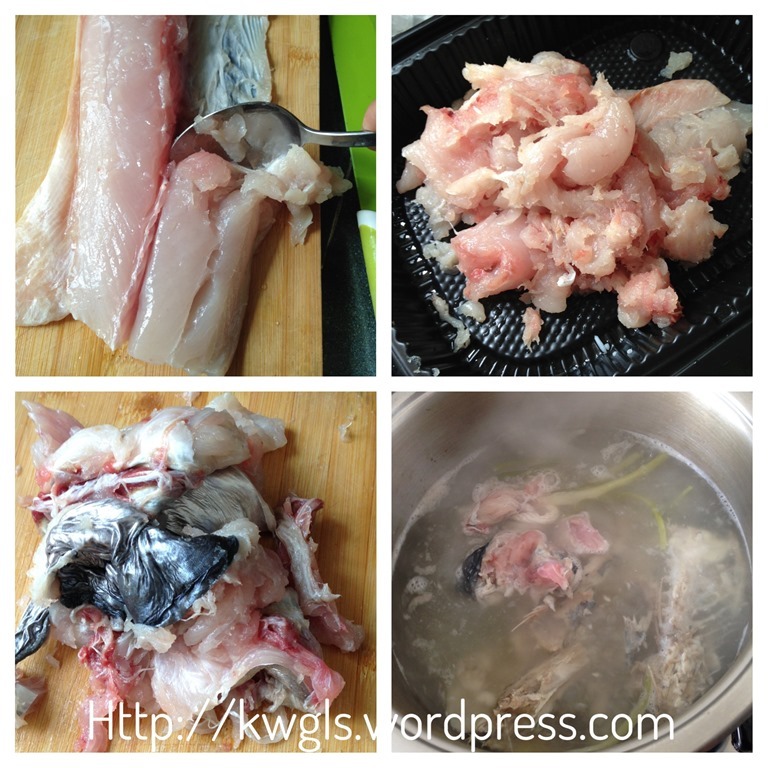 If you do not have a food processor, use the back of a knife and chop the fish meat until as fine as possible. You can also put the fish meat in a food processor, blend until as fine as possible. The fish meat will gradually become stickier and stickier. Add in half of the ice cold water gradually, the corn starch, white pepper, salt and egg white (optional), beat until well combined into a sticky paste. Transfer to a mixing bowl. Use a pair of chopstick and stir in an unilateral direction for at least 15 minutes. In this process, gradually add in the other half of the water. 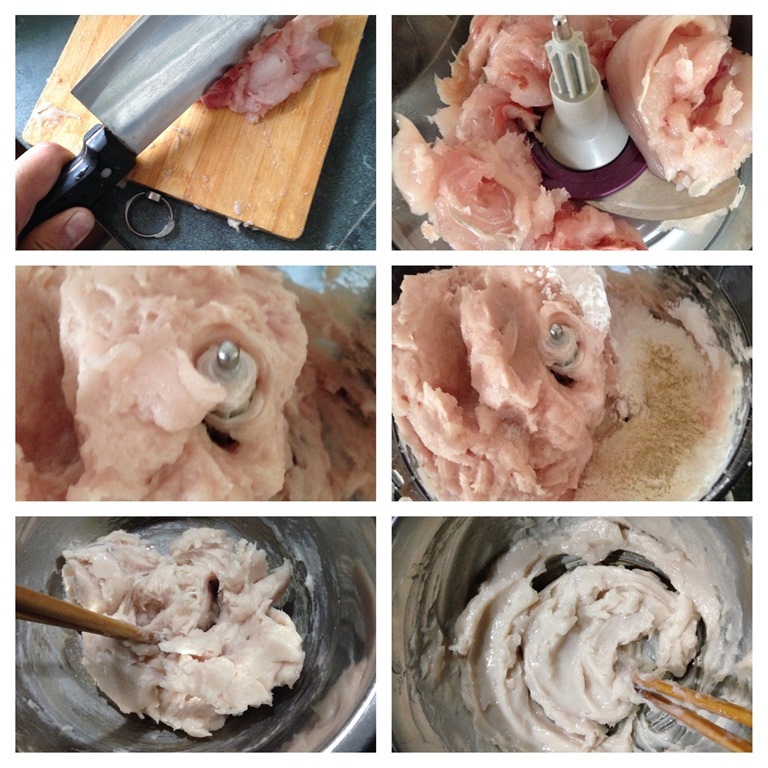 As you stir, you will see the fish paste become smoother and smoother and become glossier. Alternatively, shape the fish paste in a big ball, slam the fish paste onto a bowl or chopping board for at least 50 times. This will also force the air out in the fish paste and making it a springier fish ball. You can opt to perform either one or just chose a combination of both. The bottom line is the fish paste become smooth and shinny. In this illustration, I have used the chopstick method for about 15 minutes and I just slammed a few times to force the air out before proceeding to the next step. 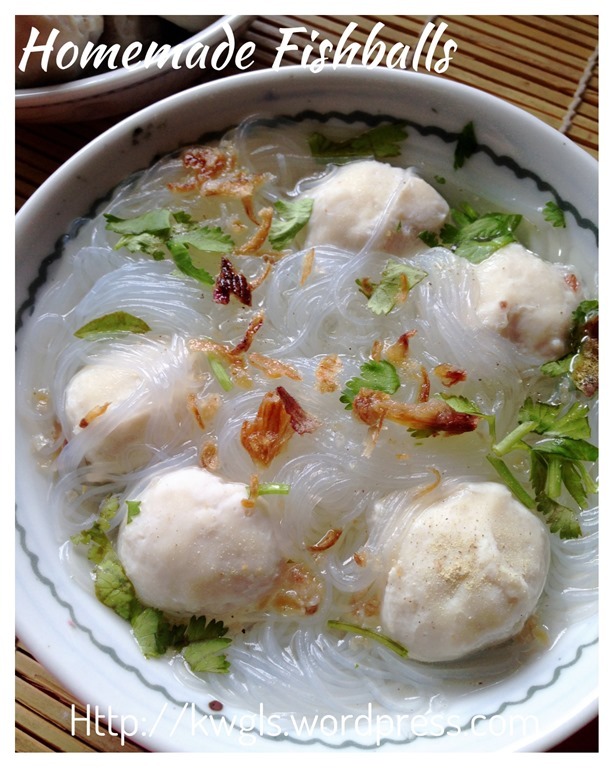 To cook the fish ball, have a pot of hot boiling water. Wet your hand with some water, have some fish paste in your hand, squeeze out and use a tablespoon to scope out the portion being squeeze out. 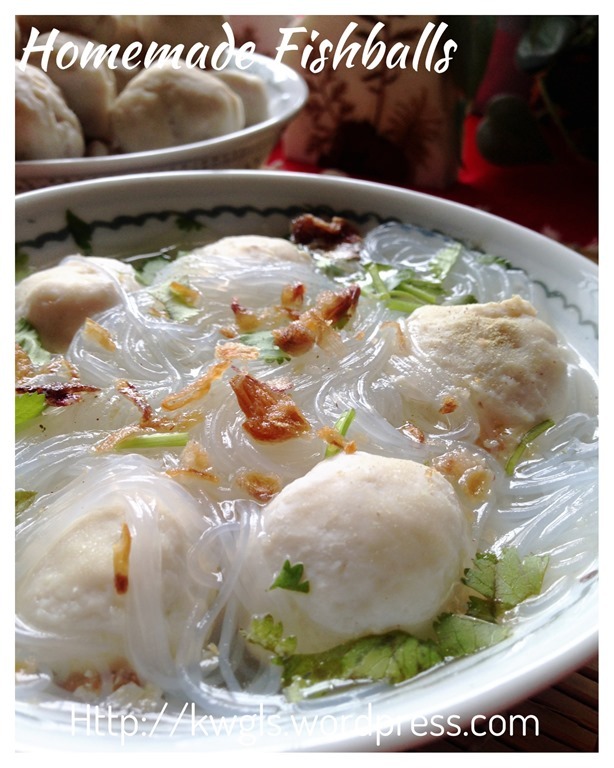 Drop it into the hot boiling water, once the fish balls float up, it is considered as cooked. Choosing the fish – Most elders will know that Ikan Parang (西刀鱼 or wolf herring) is ideal as it is tasty and produce a more bouncy fish balls. However, there are a lot of small bones and pounding or blending will need to be much longer. 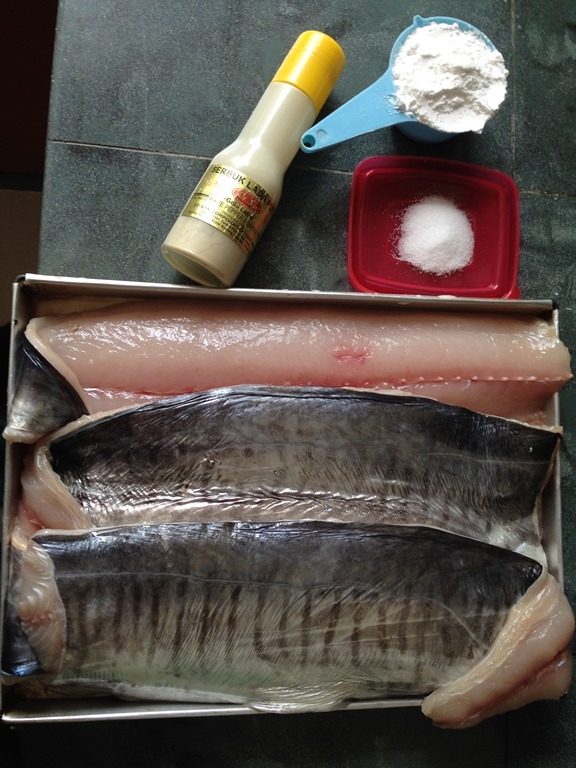 Other common types of fish are Ikan Tenggiri Batang and Ikan Tenggiri Papan (马交 or Spanish Mackerel). These fish are less fishy, less fine bones, no scales with lots of fleshes). In fact any fish can also be used but it will produce different fish balls of different texture and fishiness. Every recipe will tell you almost the same type of ingredients for fish balls. It is just fish, water, some seasonings and some starches (which are optional).. What is important for bouncy fish balls is the slamming or constant stirring of the fish paste. 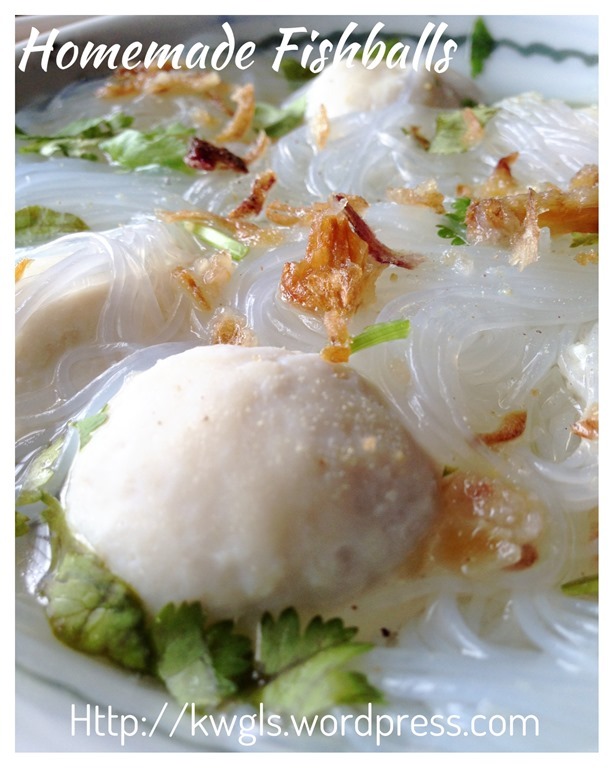 However, the springiness can never be compared to the commercially sold fish balls. As far as I am concerned, I can always forgo such sponginess as I knew exactly what are the ingredients used to make the fish balls. 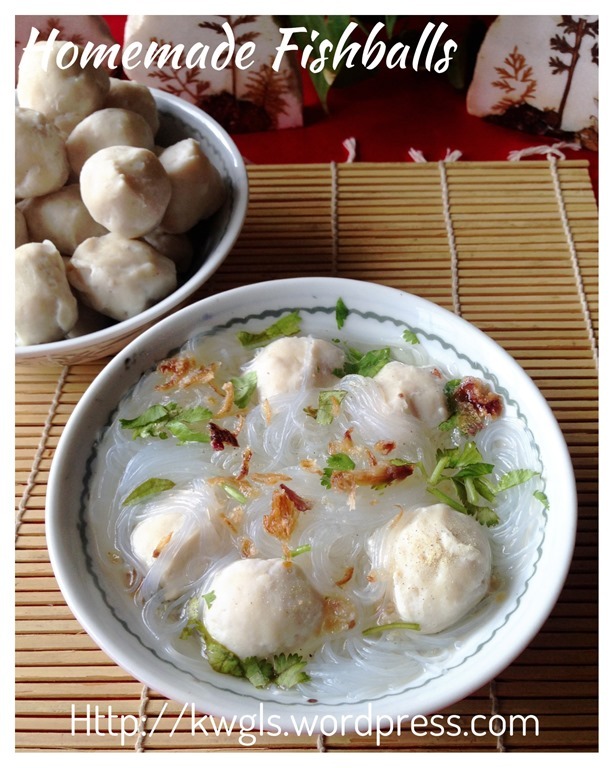 This entry was posted in Food Preparation Series, Meat Dishes, Sauces and Pickles, Seafood Dishes and tagged 8, 自制鱼丸, 鱼圆， fish balls, GUAI SHU SHU, Guaishushu, homemade fish balls, kenneth goh, postaday. Bookmark the permalink. 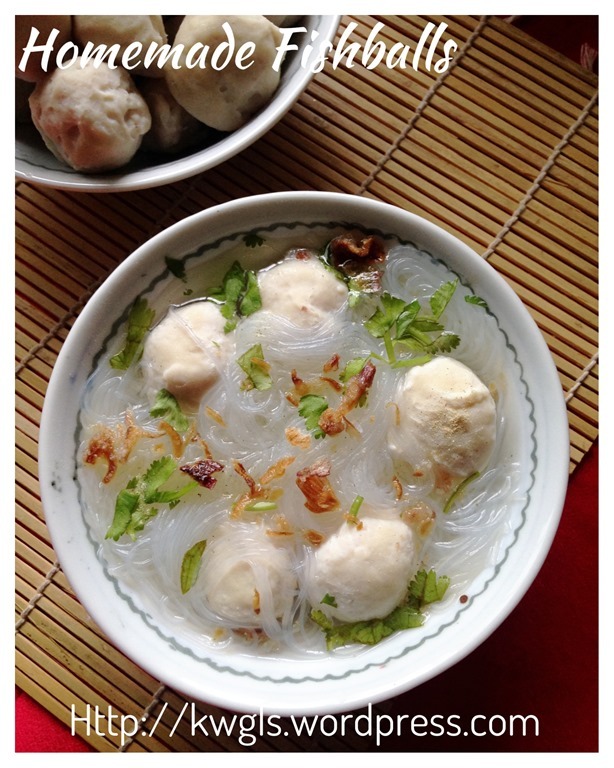 how do you freeze the fishballs; boiled them prior to freezing?